Navigating an app store can be tricky, with vague descriptions, dubious user reviews, and sometimes buggy apps. We searched for the best apps available. Free If you have friends that use a variety of different IM services and you don’t want to have to switch between individual apps, IMO Chat will feel like a godsend. It connects to AIM, Facebook Chat, GTalk, and Yahoo (and a few others); it also permits you to be signed in to multiple accounts at once. 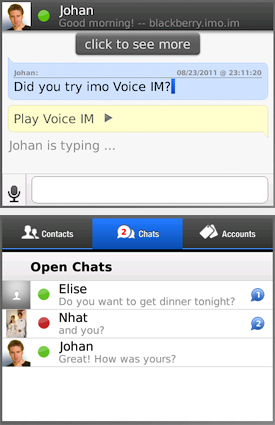 IMO Chat is great for chatting with coworkers on GTalk, while saying hello to friends on Facebook. Free Perfect for anyone who can’t stand spelling errors, this app can help you make sure that you never misspell another word. It can also read words back to you aloud (in case you don’t know how to pronounce them), and it has a thesaurus mode, as well. Free Purchase, manage, and redeem Groupon deals directly from your phone. This mobile version of Groupon also lets you share deals with your friends so all of you can take part in that killer all-you-can-eat pizza deal. Free PageOnce lets you pay your bills, keep track of your accounts, and in­­stantly see your most recent purchases and deposits. You can also schedule real-time alerts when bills are due so you’ll never miss an important payment. Free Kayak is your one-stop app for vacation planning: Book a flight, rent a car, find a hotel, and track your flight. Kayak compares hundreds of travel sites at once so you know you’ll get the very best deal on your well-deserved trip. $10/year for premium version Google Maps may be one of the best navigation apps, but iPhone and BlackBerry owners miss out on its turn-by-turn directions. Enter TeleNav, which offers those directions; it also helps you find cheap gas prices nearby, discover local restaurants, and view 3D maps. Free iMapMyRun uses GPS to track your fitness activities, such as running or cycling. You can record distance, pace, duration, speed, elevation, and calories burned for each workout. You can also upload your fitness data to MapMyFitness.com, and challenge friends to virtual races.